DECATUR, Ill. and MCLEAN, Va., 2017-Apr-10 — /Travel PR News/ — Hilton‘s (NYSE: HLT) Hampton by Hilton brand, the global mid-priced hotel known for providing travelers with its signature Hamptonality service today (April 05, 2017) announced the opening of its newest property in Decatur, Illinois. This 80-room Hampton by Hilton offers warm surroundings, a friendly service culture and a staff that makes sure guests are 100 percent happy. Guaranteed. “At Hampton Inn by Hilton Decatur Mt. Zion, guests will have everything they need to ensure a happy and memorable stay,” said Kevin Dandrea, general manager. “We strive to offer consistent and quality accommodations with value-added amenities such as large comfortable rooms, an indoor pool, and high speed internet. Owned by Evergreen Hospitality, LLC and developed by Horve Hospitality, Hampton Inn by Hilton Decatur Mt. Zion offers guests amenities such as free hot breakfast, featuring delicious waffles and seasonal offerings including fresh fruits, or On the RunTM Breakfast Bags for the on-the-go traveler. Additionally, its complimentary Wi-Fi, 24-hour business center and JumpStart Fitness Center are sure to set any guest on the right track. Each guestroom includes HDTV, free in-room movie channels and a coffeemaker. Hampton Inn by Hilton Decatur Mt. Zion is located at 4855 E. Evergreen Ct, Decatur, IL 62521, just one mile from the Decatur airport with close proximity to Mt. Zion, the Mt. Zion convention centers and industry leaders, such as ADM. The hotel features a meeting space, an indoor pool, a complimentary breakfast and our TREATS shop, which is a food and beverage shop filled with snacks, toiletries, local merchandise and drinks for purchase 24 hours a day. Hampton by Hilton has long been known for its unique and unmatched approach to hospitality. Team members proudly exhibit a unique culture described as Hamptonality. This term is defined by each hotel’s approach to friendly customer service, anticipation of guests needs, and establishing an authentic, friendly and caring culture. Hampton Inn by Hilton Decatur Mt. Zion is part of Hilton Honors, the award-winning guest-loyalty program for Hilton’s 14 distinct hotel brands. Hilton Honors members who book directly through preferred Hilton channels save time and money and gain instant access to the benefits they care about most, such as an exclusive member discount, free Wi-Fi and a flexible payment slider that allows members to choose nearly any combination of Points and money to book a stay. Members can also redeem their Points for free nights, to gain access to unique events through the Hilton Honors auction platform or to make purchases with at Amazon.com with Amazon Shop with Points. For more information or to make reservations, please visit Hampton Inn by Hilton Decatur Mt. Zion or call +1 217 864 3297. 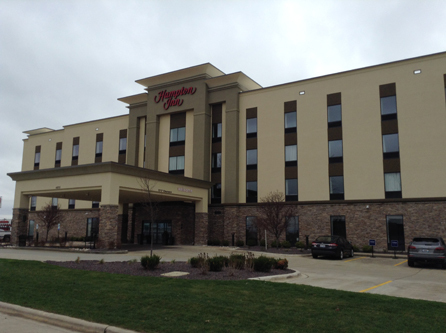 This entry was posted in Business, Hospitality, Hotels, Resorts, Travel, Travel Management, Travelers and tagged Decatur, Hampton by Hilton, Illinois, Kevin Dandrea. Bookmark the permalink.